The opening scene of Evidence is quite a thing to behold. The camera swoops into what appears to be the scene of a brutal car accident and as the still shot is extrapolated into a three dimensional image, the camera continues to move through the scene, capturing small moments of terror. It's a great opening, even if the style borrows heavily from any given episode of "CSI: Miami" but it's a scene that just keeps going, for far too long. When the movie actually starts, there's already a sneaky suspicion that things aren't going to play out in any sort of memorable way. The accident turns out to be the scene of a grizzly mass murder. A group of individuals were on their way to Las Vegas when their bus ran into some trouble. Stranded in the desert with no cell signal, no emergency phone and almost no water, they make their way to a garage they passed a few miles away where they run into even more trouble. All of these details are pieced together by the police with the help of the lone survivor and the various cameras found on the scene. But Evidence isn't your typical investigative thriller where the cops hit the pavement in search of clues. "Witnesses lie. The camera doesn't," says Detective Burquez (Radha Mitchell) and so instead, she and Detective Reese (Stephen Moyer) settle into a hi-tech room full of TV screens and a couple of tech guys and proceed to solve the case using only the video footage found at the crime scene. Essentially, it's all an elaborate set-up for a found footage horror movie. Most of the footage is captured by two best friends, one has aspirations of being a Hollywood star while the other has directing dreams and she's capturing her friend's rise to stardom for a future episode of "Before They Were Stars." There's also bit of cell phone footage from another bus rider, Dale Dickey (seen most recently on "True Blood" as Alcide's bitchy pack elder) playing up the creepy to extreme effect. Dickey only appears on screen for a short while but the fact that she's by far the most memorable of the characters says quite a bit for the quality of the acting throughout. Even the great Harry Lennix seems to be sleepwalking through the few scenes he has, a shame considering his usual magnetic appeal. Evidence unfolds with long portions of camera footage intercut with scenes of the detectives trying to put the pieces together. A room full of tech equipment and TV screens isn't very dynamic and director Olatunde Osunsanmi (The Fourth Kind) doesn't make things any more interesting by circling the actors repeatedly. It's unnecessary, distracting and takes away from performances that are already near flatlining. Moyer is completely uninteresting as a detective with some baggage who begs his way into the room with his mad video skillz while Mitchell looks completely dumbfounded by the entire thing. It's strange to see a character go from being in charge to seeming completely clueless about what's unfolding right in front of her. There's a lot of techno jargon about pausing and magnifying and cleaning pixels... it's not only boring but it saps what little energy the found footage scrounges up. It's by no means terrible, the final reveal is an unexpected and perfect way to wrap the story and I did like the concept of the movie and some of the ideas of stardom and celebrity, art and the importance of media that writer John Swetnam works into the story but the ideas are all a little too vague. In the end, Evidence is plagued by lackluster performances and poor editing that cuts away from the good scenes only to highlight boring ones; it's neither an interesting police procedural nor a memorable found footage movie. 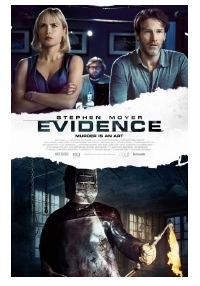 Evidence is now available on VOD and opens theatrically in NY, LA and other markets today.